Donkey Kong, manufactured by Nintendo, holds a copyright of 1981 and was available in both upright and cocktail table versions. It's game play was simple; Make it to the top of the building without getting hit be a barrel, torched by a fireball or squashed by a mudpie. The restoration wasn’t too bad. I bought my Donkey Kong at one of the US amusement auctions in working order. The control panel wasn’t too bad but it needed new buttons and a joystick. The cabinet had no side art and a few battle scars. A trip to the paint store got me a color matched quart of paint to fill in the scratches, and help from the Arcade newsgroup got some side art for the machine. Another deal on the newsgroup landed a nice front monitor glass as mine was scratched. The original light behind the marquee was shot, so I got a new lamp fixture from the hardware store as the Nintendo original uses a fixture with a weird starter that no one will ever find. The coin door came off and was repainted and the aluminum coin area was cleaned and sandblasted. All in all it’s a nice addition to the Basement Arcade! The Game Archive has Donkey Kong flyers for you to view! Use the link provided to return here after you check them out! 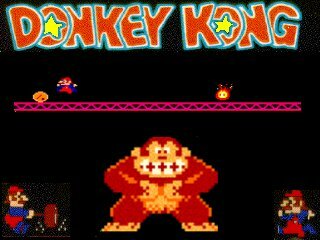 Do you have a Donkey Kong arcade game and need some of it's technical information? Click here for all the switch setting.